The study analyzed data from a survey of 3,100 U.S. online shoppers conducted by comScore in February of 2012. While overall satisfaction is generally high among online shoppers, the study revealed that shoppers are least satisfied with the flexibility offered when it comes to delivery dates and re-routing packages, and the ease of making returns and exchanges. The study also revealed that, while 58% of online shoppers chose free or discounted shipping when asked what aspect they would like to see retailers improve, comScore’s analysis showed that free shipping is actually not as important as returns when it comes to overall satisfaction. According to the survey, 63% of online shoppers will look at a retailer’s returns policy prior to purchasing an item. For retailers, this is an opportunity to solidify a sale. With a clear-cut and flexible returns policy, online sellers are more likely to increase orders. Sellers are also more likely to generate an increased amount of repeat and referral business. 48% of survey respondents said they would shop more often with an online retailer if they had a lenient, easy-to-understand returns policy. Another 48% of respondents said they would recommend the retailer to a friend. Returns policies are important across the board. 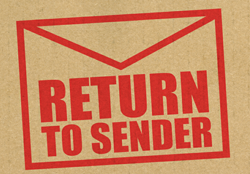 While certain types of products, such as apparel or footwear, may get returned more often than others, the comScore survey found that shoppers have similar feelings regarding a clear and lenient returns policy, regardless of what they’re purchasing. So what constitutes a “clear and lenient” returns policy? According to the survey, 62% of shoppers felt that including a return label in the original order is an important part of creating the best returns experience, while 61% of respondents said that retailers should provide an easy-to-print returns label. Over half (57%) of online shoppers feel an automatic refund is an important part of a good returns experience, and just under half (47%) said that an easy-to-follow returns procedure is important. Online shoppers are least satisfied with the current lack of flexibility to re-route packages when making a purchase. Product price and shipping charges are taken into consideration almost equally by consumers when making an online purchase. Free shipping was the top answer used by online shoppers when asked what would lead or has led to a recommendation of a retailer. Timely arrival of shipments and free or easy returns were other factors cited by shoppers that would cause them to refer a retailer. When looking at the information or options most important to online shoppers during the checkout process, 60% said they wanted an estimated or guaranteed delivery date, and 38% wanted expedited shipping options. When it comes to order fulfillment, 81% of online shoppers said that they’re willing to wait at least 4-5 days to receive their packages, and 23% are willing to wait 8 days or more. Over half of consumers expect both economy ground and ground as delivery options when shopping online, and the most economical order fulfillment option is chosen two-thirds of the time. 75% of shoppers feel that tracking information is important for their online purchases, and nearly half (45%) felt email or text notifications with a tracking number was the most important tracking service. Overall, this study revealed that, for retailers, providing transparency is as important as flexibility when it comes to returns policies, shipping charges, fulfillment and delivery options, and order tracking. It also showed that, of these items, a friendly returns policy represents the biggest opportunity for online sellers to create a better shopping experience for consumers, and thus, a way to increase sales from both new and existing customers. A returns policy can impact multiple departments, from sales (as this study revealed), to marketing, accounting, warehousing and fulfillment. For retailers that may be considering modifying their returns policy, it’s a good idea to involve these different departments, and if using an outsourced fulfillment center, first make sure that their returns policy is also easy to understand, and that they understand what your policy is for your customers. To download the full comScore study, click here.